Damian Lillard is making noise! 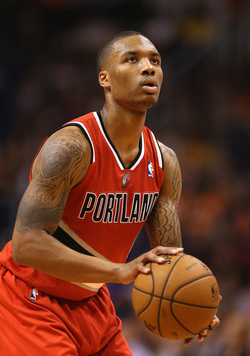 The NBA Portland Trail Blazer's star talent is today's face of African American LILLARDs. Celebrity has, definitely, propelled Damian into the spotlight, especially after being unanimously named NBA 2013 Rookie of the Year! The 6'3'' point guard is a West Coast LILLARD, who was always encouraged by his family to excel in whatever he chose to do. Hailing from Oakland, California, Damian played for coach Orlando Watkins at Oakland High School, where he was First Team All-League his junior and senior years. Remaining out West, Damian played collegiately at Weber State University in Ogden, Utah, where he led the nation in scoring through most of the 2011-12 season. Regarded as the top point guard prospect in the country, Damian decided to forego his senior year at Weber State and declared himself eligible for the 2012 NBA Draft. He was drafted in the first round with the sixth overall pick in the 2012 Draft by the Portland Trail Blazers, making him the highest drafted player ever to come out of Weber State! Damian agreed to a deal with the Trail Blazers on July 13, 2012, and made his NBA debut on October 31, 2012 against the Los Angeles Lakers. He immediately captured the attention of the professional basketball world by scoring 23 points with 11 assists, joining Oscar Robertson and Isaiah Thomas as the only players in NBA history with at least 20 points and 10 assists in their NBA debuts! After a truly spectacular season, Damian Lillard was named NBA 2013 Rookie of the Year, joining the illustrious ranks of Wilt Chamberlain (1959-60), Jerry Lucas (1963-64), Michael Jordan (1984-85), and Blake Griffin (2010-11), among other NBA greats. Damian hit a buzzer beater three pointer in Game 6 of the first round of the 2014 NBA Playoffs to lead the Blazers to a series victory over the Houston Rockets! ​Damian wears the jersey number #0, to signify the importance the letter O has had in his life's journey: from Oakland to Ogden, to Oregon. Oh, and by the way, Ollie is his middle name. A Christian, Damian has the scripture Psalm 37:1-3 on his left arm. ​For those who are not aware, Damian is also a hip-hop artist and rapper. The Letter O, his debut album, dropped on October 21, 2016. Moving strategically into product endorsement and merchandising, Damian has a signature shoe line out called the "Adidas Dame." ​Damian's genealogical lineage goes back to James "Jim" Lillard (b. abt. 1846, Rutherford County, Tennessee). Oh! And check out Damian's commemorative Limited Special Edition shoes released by Adidas in honor of his spectacular NBA 2013 Rookie of the Year campaign! You go, Damian! Holdahl: Fans Camp In Line For Nine Hours For Blazers G Damian Lillard's ROY Adidas Shoes. You, definitely, want to catch the video of Damian signing his Adidas 'Rookie of the Year' shoe for fans in Portland on this link! Appreciate you, greatly, man! You make us all proud! That's why you, Damian Lillard, are our IN THE SPOTLIGHT choice! 09/16/2015 Ralph Emerson Lillard, 83, Cleveland, TN Resident, Lillard Family Historian, Obituary - It is with the deepest sadness that I inform you of the passing of Ralph Emerson Lillard of Cleveland, TN, at the age of 83, on September 16, 2015. Born July 3, 1932 in Benton, Tennessee, Ralph Emerson Lillard was a Lillard Family genealogist and historian, who loved all branches of the Lillard Family everywhere, regardless of skin color, ethnicity, or religion. From 1979, Ralph served as Secretary-Treasurer of the Lillards Family Association, and beginning in 1989, hosted the Family Reunion at his Tennessee home. For many years, Ralph published and distributed Lillard Lines, a newsletter of Lillard Family news, stories, and information. His extensive research assisted in the preparation of David Hicks Lillard, Jr.'s excellent 2-volume genealogy Lillard: A Family of Colonial Virginia, Second Edition, Southern Historical Press, (1991), especially the portions regarding the descendants of James Lillard (born c. 1725) of Culpeper, VA. Ralph Emerson Lillard will be greatly missed by all who knew him for his great knowledge of Lillard Family history, his generous spirit, and his love for his fellow man. Click here for the obituary of Ralph Emerson Lillard.